Lane: used to organise and categorise activities within a pool according to function or role, and depicted as a rectangle stretching the width or height of the pool. A lane contains the flow objects, connecting objects and artifacts. 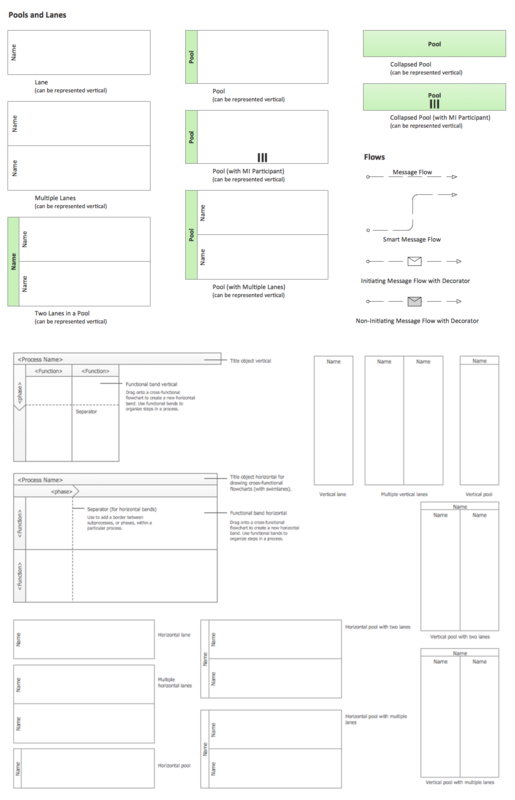 The Swimlanes library design elements provides a visual mechanism of organizing and categorizing activities in BPMN 2.0 diagrams. Use Pool type Swimlane objects to show major participants in your business process. Use Lane type Swimlane elements to visually organize and categorize activities in a pool by function or role. Use the ready objects from the libraries of Business Process Diagram Solution for ConceptDraw DIAGRAM BPM Software and also collection of Business Process Diagram examples, samples and templates to create your own professional looking BPMN Diagrams of any complexity quick, easy and effective. All source documents are vector graphic documents. They are available for reviewing, modifying, or converting to a variety of formats (PDF file, MS PowerPoint, MS Visio, and many other graphic formats) from the ConceptDraw STORE. 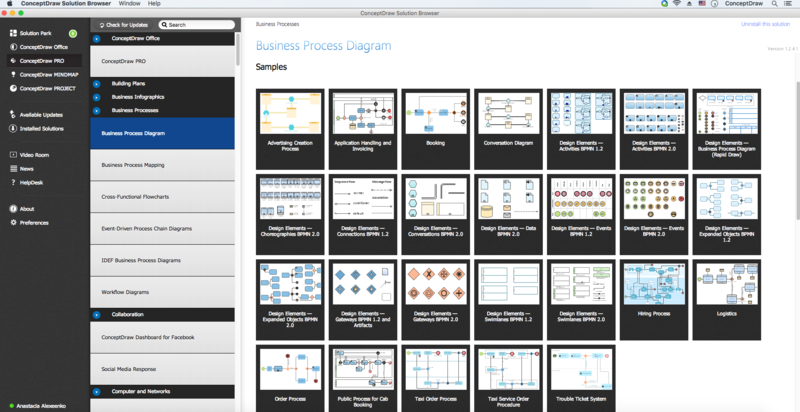 The Business Process Diagram Solution is available for all ConceptDraw DIAGRAM or later users. Swimlanes are a visual mechanism of organizing and categorizing activities, in BPMN consist of two types: Pool, Lane. Use ConceptDraw Swimlanes library with 20 objects from BPMN. Create professional business process diagrams using ConceptDraw Activities library with 34 objects from BPMN.